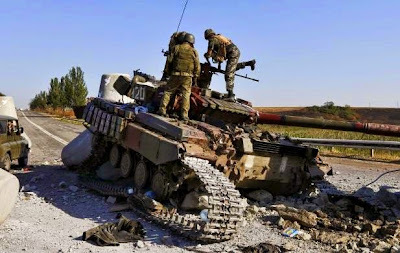 MARIUPOL, Ukraine -- Ukrainian government forces came under artillery fire late on Saturday near the strategic port of Mariupol in eastern Ukraine, in the first serious violation of a ceasefire declared only about 30 hours earlier. Ukrainian soldiers inspect a damaged tank on the outskirts of the southern coastal town of Mariupol, September 6, 2014. The presidents of Russia and Ukraine had earlier said the ceasefire, part of a peace road-map intended to end five months of conflict, was largely holding across eastern Ukraine, where Kiev's forces have been battling pro-Russian separatists. A Reuters reporter heard prolonged artillery fire late on Saturday to the east of Mariupol, a key flashpoint in the past week of fighting, and then saw a truck, a gas station and an industrial facility ablaze within the limits of the city. The reporter also saw trucks rushing eastwards conveying agitated-looking pro-government militia volunteers. Tanks and armored personnel carriers also headed in the same direction. "There has been an artillery attack. We received a number of impacts. We have no information about casualties," a Ukrainian officer told Reuters. The area had previously been quiet since the ceasefire took effect on Friday evening, but many residents and combatants in Mariupol and in Donetsk, the other main flashpoint in the conflict, have expressed doubts that the ceasefire can last. In his statement, Ukraine's President Petro Poroshenko said he and Russia's Vladimir Putin had agreed in a telephone call that "overall the ceasefire was being implemented" and that they needed to find ways to make it more durable. Envoys of Ukraine, Russia, the separatist leadership and Europe's OSCE security watchdog approved the ceasefire in Minsk on Friday as part of a peace roadmap that also includes an exchange of prisoners of war and establishing a humanitarian corridor for refugees and aid. Poroshenko agreed to the ceasefire after Ukraine accused Russia of sending troops and arms onto its territory in support of the separatists, who had suffered big losses over the summer. Moscow continues to lie and denies sending troops or arming the rebels. In the days before the ceasefire, government forces had been trying to repel a major rebel offensive targeting Mariupol, a key port for Ukraine's steel exports. Kiev says the rebels were backed by Russian troops, a charge Moscow has denied. Although the ceasefire had mostly held during Saturday, citizens in the other main flashpoint, the rebel-held industrial city of Donetsk, complained of sporadic shelling and gunfire, especially near the airport, which remains in government hands. "The ceasefire is looking good for now but we know they (the Ukrainian side) are only using it to bring in more forces here and ammunition and then to hit us with renewed strength," said one rebel commander in Donetsk known by his nickname Montana. Colonel Andriy Lysenko, the spokesman of Ukraine's National Security and Defence Council, said Kiev wanted the exchange of prisoners of war to take place "as fast as possible" but gave no timeframe. He said the rebels were holding more than 200 Ukrainians captive. Poroshenko spent Thursday and Friday at a NATO summit in Wales at which U.S. President Barack Obama and other leaders urged Putin to pull its forces out of Ukraine. NATO also approved wide-ranging plans to boost its defenses in eastern Europe in response to the Ukraine crisis. The Ukraine conflict has revived talk of a new Cold War as the West accuses Putin of deliberately destabilizing the former Soviet republic. Putin says he is defending the interests of ethnic Russians facing discrimination and oppression. The Kremlin leader came under fire on Saturday from another source. Patriarch Filaret, head of Ukraine's Kiev-based Orthodox Church, said Putin had fallen under Satan's spell and bore personal responsibility for all the bloodshed. Filaret, whose church broke from the Moscow Patriarchate in 1992 after the fall of the Soviet Union and the advent of an independent Ukraine, compared Putin, a baptized Orthodox Christian, to Cain, who in the Bible killed his brother Abel. The European Union announced new economic sanctions against Russia late on Friday over its role in Ukraine but said they could be suspended if Moscow withdraws its troops and observes the conditions of the ceasefire. Russia's foreign ministry responded angrily on Saturday to the measures, pledging unspecified "reaction" if they were implemented. Moscow responded to a previous round of U.S. and EU sanctions by banning most Western food imports.